After finishing touches were completed in our brand new underground power facility, our crews quickly began to restore the site to its original conditions. Walls came down, irrigation lines were returned to original positions, the fence slowly rolled back, and our bluestone pavers were reset to bring back our 40th Street plaza. 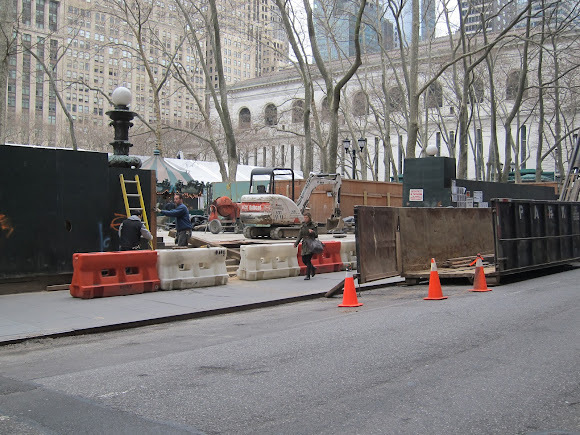 Here you can see one of the first views from 40th Street directly to Le Carrousel since Spring 2011 when the construction fence was erected. 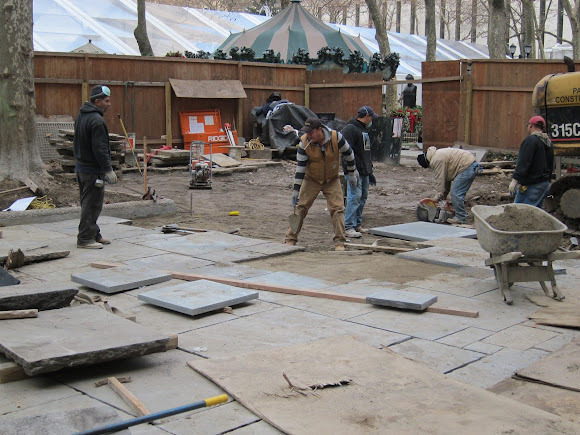 Laying pavers is relatively quick work if everything goes smoothly. 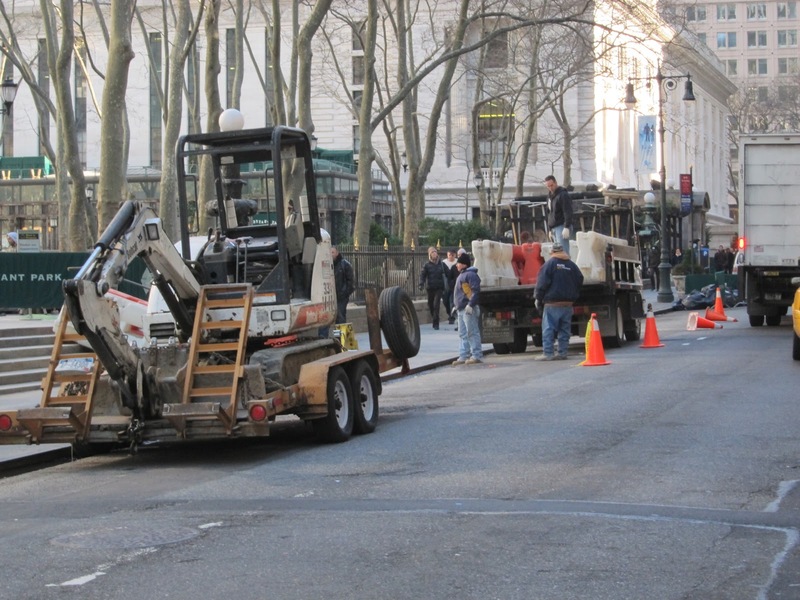 Unfortunately, we encountered some leaking conditions while restoring the plaza, and twice had to halt restoration work to inspect and waterproof the site. 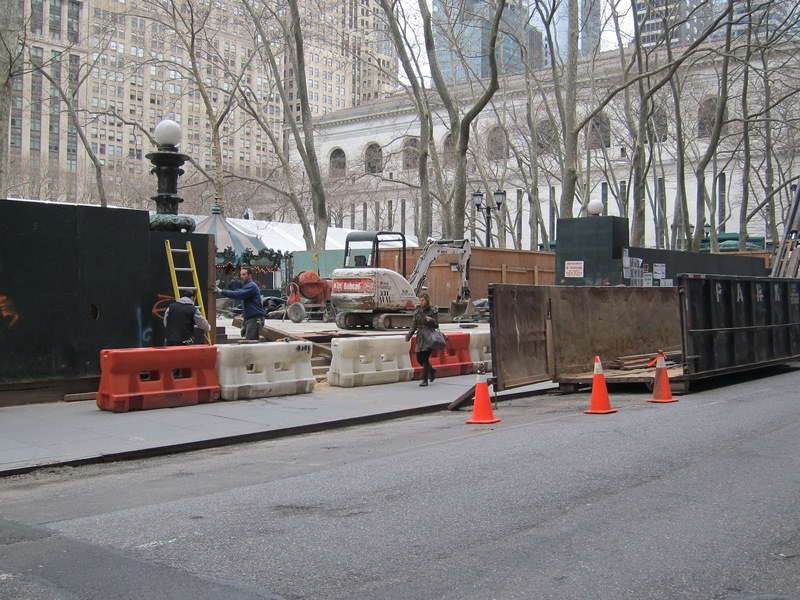 Below you can also see the day that our crews rediscovered the stairs to 40th Street - our long lost entrance to the park! The carousel kids will be happy to see this quick access entrance restored. The black tar-looking substance below is an example of our careful waterproofing around the entrance to the power facility. The vehicles on 40th Street show the final barricades, debris and machinery being hauled off-site... a major achievement for our construction team. And finally, the area has been reopened to the public. The custom hatch door will lie flush with the existing pavers, and have special hydraulics to open the door on the rare occasion our electrician has to adjust something in the switchgear room. It's being fabricated now, and we expect to install in the early spring. Our horticultural and design teams will also swoop in to make the area look lively and green again. Come spring... you won't even know what you're sitting above.